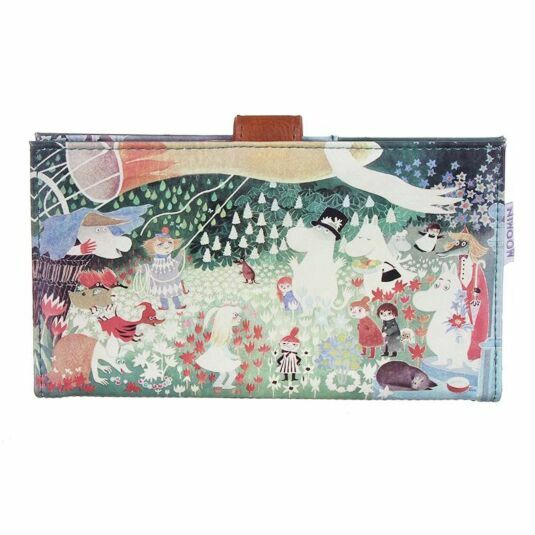 Join the Moomins as they come together with all your favourite characters from the story books in this Dangerous Journey themed accessory. This classic image by Tove Jansson shows a flurry of characters from the beloved Moomins stories, all dancing around the woodland. Bursts of flowers and leaves dance against the green background, and the lush foliage shows that spring has returned and summer is on the way. 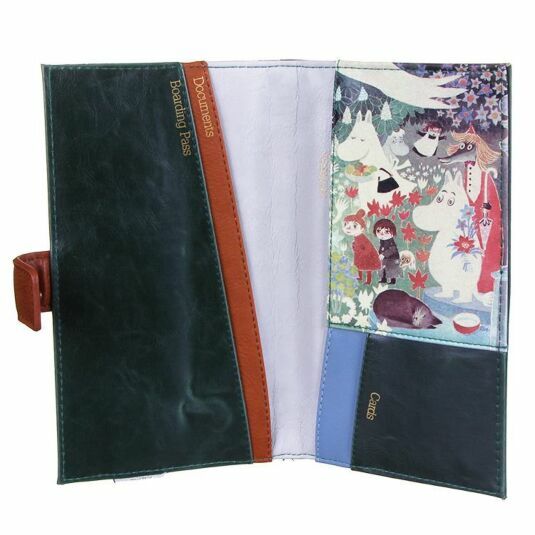 The image is faded with bright white tones against vibrant colours of red and mainly green, as were most of the illustrations in this famous series of children’s books, and gives a simple elegance to this practical wallet from Disaster Designs. This travel wallet is the most practical and bold of fashion accessories, with an overall faded rainbow style of colouring, in vintage tones, with a brown faux-leather strapping to keep documents secure. The interior opens to reveal a double-sided wallet, one side fitted with a pair of length way holders in a dark grey and brown that read 'Documents' and 'Boarding Pass' in a golden font. On the opposite side of the piece a large slot is found to hold a passport. 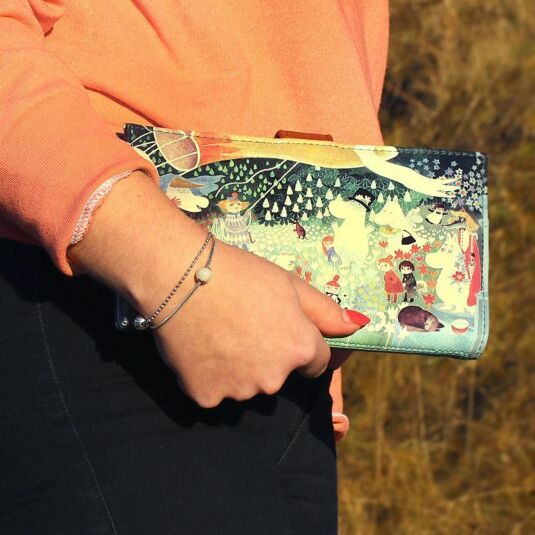 A finishing card holder is found beneath this, with a golden 'Cards' print of text illustrating this. 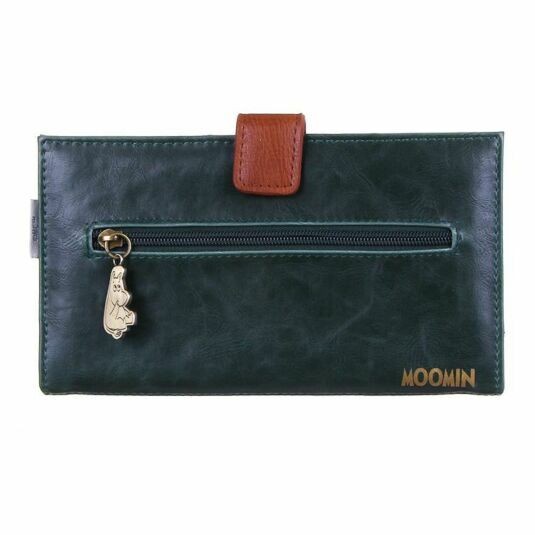 On the reverse of the piece a large zip pocket is found to carry such items as currency or valuables, and is easily accessible through a brushed gold Moomintroll zip-pull. With their usual attention to detail, Disaster Designs have even included a card product label which can be folded to stand up, embossed with the Moomin logo and featuring a dancing popup Moomintroll. 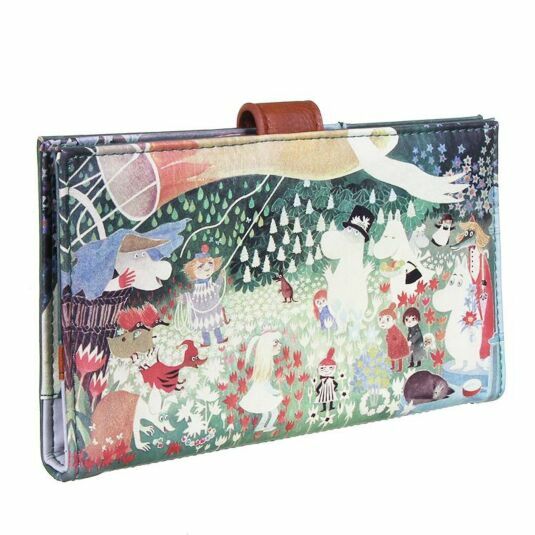 This travel wallet makes a lovely gift for anyone who enjoyed the tales of the Moomins in their childhood, but also simply as a unique and practical piece for when travelling. Its spacious interior means it would make a fitting gift for girls of all ages, from daughters to mothers and granddaughters, as the legacy of Tove Jansson dates from the 1940’s and her books have never been out of print.